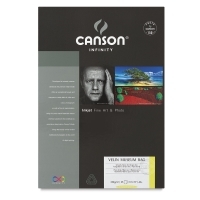 For centuries, Velin Museum Rag has been chosen by world-renowned artists to create lithography, intaglio etchings, engravings, and collotypes. 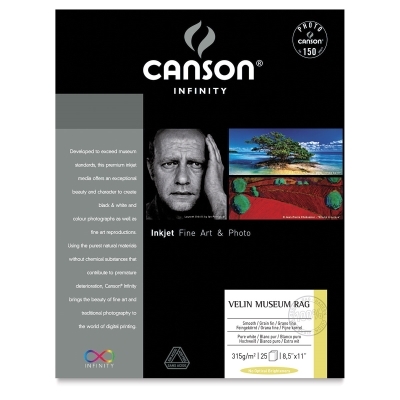 Now, Canson has developed Canson Infinity Velin Museum Rag Paper for fine art and photographic reproductions on inkjet printers. 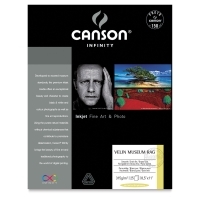 This mouldmade, 100% cotton paper has a smooth, fine-grained surface and structure, and a pure white tone that is ideal for sophisticated, museum-grade photographs and fine art prints. 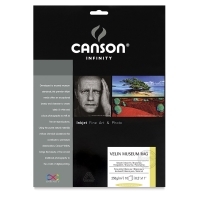 Canson Infinity Velin Museum Rag is compatible with pigmented and dye inks, dries instantly, is water-resistant, and contains no optical brightening agents. 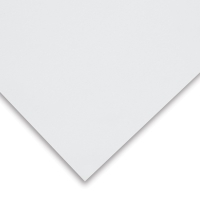 Naturally age-resistant, it is internally buffered and acid-free.